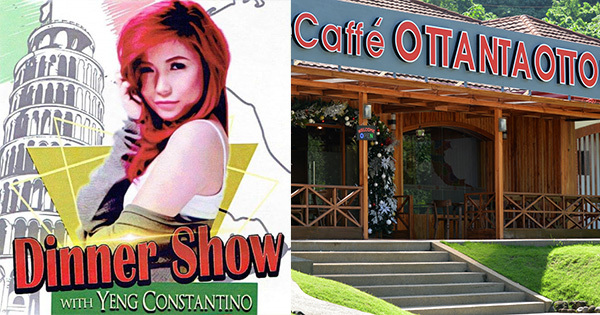 A special dinner show featuring superstar singer Yeng Constantino will be held on Saturday, December 17th from 6pm to 8pm at Caffé Ottanta Otto, the newest finest and most authentic Italian restaurant in the Philippines. Located on the property of the beautiful 88 Hot Spring Resort in Laguna province (9061 National Hwy, Brgy Bagong Kalsada, Calamba City), Caffé Ottanta Otto is a new fine dining restaurant that serves fresh and original Italian pasta, pizza, cappuccinos, and more. Up to 500 guests can attend the special VIP dinner show, which includes a full course Italian meal (salad, soup, pasta, dessert, fruits and coffee). Attendees will also enjoy an up-and-close performance by Yeng Constantino, a Filipina pop-rock singer-songwriter and actress. Yeng, who is best known for her hit songs "Ikaw," "Paasa," and "Pag-ibig", recently celebrated her 10th year in the music industry. She is also known as a former co-host of the second season of The Voice Kids, alongside Luis Manzano and her cousin Robi Domingo, which aired on ABS-CBN in 2015.